The Qualifications: Diplomas Certificates and Awards. All of our Level 3 qualifications are available as an Award, Certificate or Diploma. Whats the difference between, Diplomas Certificates and Awards. All three qualifications follow the same course work; it is only the assessment process and total learning hours which differ. A diploma will allow you to work within the NHS or health sector. An Award and Certificate will allow you to be a mobile therapist, have your own business or work within a salon or spa environment. The Awards, Certificates and Diplomas will give you a great foundation to be a fully qualified, insured, accredited and registered therapist. Options for your progression: Aromatherapy Massage, Reflexology, Sports massage level 3, Indian Head Massage, Healthy Eating Award and any of our CPD`S. Options for your progression: Your first entry point being the FHT Level 3 Diploma in Massage, Anatomy, Physiology and Pathology (A&P). Level 3 FHT Award in Indian Head Massage course is a stand-alone, professional qualification that allows you to practice as an Indian Head Massage Therapist. No A&P or other entry requirements required at all. I only want to become a Reflexologist. Start with the Level 3 Diploma in Anatomy & Physiology then move directly into the Level 3 Diploma in Reflexology. I only want to become a Sports Massage Therapist. Start with the Level 3 Diploma in Anatomy & Physiology, and Holistic Massage, and then move into the Level 3 Diploma in Sports Massage. I only want to become a Aromatherapist. Start with the Level 3 Diploma in Anatomy & Physiology then move directly into the Level 3 Diploma in Aromatherapy. What we Provide and what you should bring. Class times: Arrive from 9am. Class start 9.30-5.00. 1 hour for lunch, 2 x 15 minute tea breaks. During your training at the school you use our massage tables. During your practice and training at home you will need to purchase your own massage table. You will be advised by your tutor. During your training you will practice on each other in class, the towels you bring will be for your use only. 2 x Large Towels (approx. 100cm x 150cm), these will be used to drape over your body during the massage lessons. 1 x Bed Sheet or Massage Couch Cover with face hole for covering the massage table. You will lay on this whilst being massaged during the practical lessons. These must be Dark Blue or Black, other colours cannot be used. During the massage lessons you will be required to bring a pair of Slippers or Flip Flops for stepping off into after each massage session. You will be required to bring your own Oil Bottle and Holster for use during each massage practical session. The holster is a belt designed to hold your Oil Bottle around your waist whilst you are massaging, so it is within easy reach during the massage. You will bring your own massage oil, good quality, and organic Sunflower oil. We avoid ALL nut-based oils to prevent the risk of allergic reactions. These are used for cleaning hands, feet and your oil bottle. They must be antibacterial, baby wipes are not good enough. ITEC has a close working partnership with over 650 approved centres worldwide, and has offices in London, South Africa and Asia Pacific and representation in Ireland and the United States of America. ITEC offers centres and learners high quality regulated qualifications for employability, specialist subjects and skills enhancement. The ITEC portfolio includes qualifications in beauty and spa therapy, complementary therapies, sports and fitness, hairdressing and customer service sectors. The CThA are the leading professional association representing sports, spa and complementary therapists in the UK and Ireland. 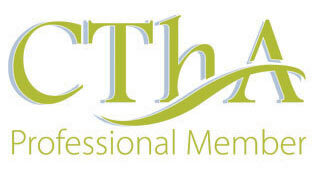 The CThA provide discounted insurance and professional recognition. Members get listed on the Embodyforyou.com website. Members also receive professional help and advice from a team of experts. We set the standards that practitioners need to meet to get onto and then stay on the register. All CNHC registrants have agreed to be bound by the highest standards of conduct and have registered voluntarily. All of them are professionally trained and fully insured to practise. CNHC is also the holder of an Accredited Register by the Professional Standards Authority for Health and Social Care, an independent body, accountable to the UK Parliament. Vocational Training Charitable Trust (VTCT) is a specialist awarding organisation offering vocational and technical qualifications in a range of service sectors. With more than 800 approved centres, VTCT has an ever expanding list of centres throughout the UK and Ireland, with increasing international presence. The Federation of Holistic Therapists (FHT) is the largest and leading professional association for therapists in the UK and Ireland. With thousands of members offering a broad range of specialisms – from sports and remedial therapies, to complementary healthcare and holistic beauty treatments – the FHT is the association of choice for professional therapists. At the FHT, our members’ interests are at the heart of every decision we make and every service we provide. As a not for profit organisation – run by therapists, for therapists – members can be sure that every penny of their fees is spent wisely, to support, advance and protect their interests and career progression as professional therapists. The FHT is governed by an elected council of members who oversee a permanent team of FHT staff, many of whom are also qualified therapists. The Council positions are voluntary and unpaid, and attract senior practitioners and educators from across the therapy industry.